Is EA Holding Back PS3 Cross-Game Voice Chat? A post on the N4G forums has rumors swirling that PlayStation 3 cross-game voice chat was held back due to threats made by EA. Kotaku spoke to EA and Sony regarding this rumor. The post, written by N4G forum-goer Super_Secret who claims to be a Sony employee, explains that Cross-Game voice chat ran into a snag because certain games from "A rather large company" wouldn't support the feature. He refers back to trouble including custom soundtracks to work in earlier PlayStation 3 firmware revisions. According to Super_Secret, PS3 titles have to be developed with custom soundtrack support, and one of this big company's more popular titles wouldn't support it. When they found out that a new firmware update was going to suddenly make one of their games look inferior to just about every other game released, they protested. A lot. 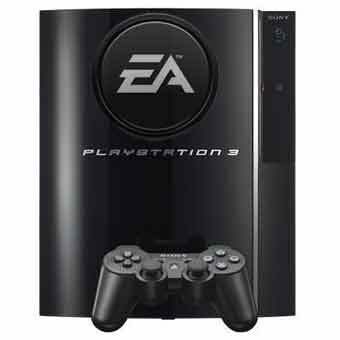 They threatened everything, from legal action to dropping support for the PS3 all together. The post goes on to suggest that a similar situation occurred with cross-game chat, causing our tips line to fill up with angry emails, one of which even referred to the situation as a "Potential WATERGATE of the videogame industry." " It's not Activision. It's not Ubisoft. It's not Capcom. It's not Insomniac. It's not Konami. It's not Take 2. It's not Midway. It's not Squaresoft. are wE All getting the picture yet? One point I want to reiterate - there's a difference between the games that didn't work with in-game XMB and the games that DID work with in-game XMB but DIDN'T work well with custom soundtracks, so stop picking out the ones that simply didn't do in-game XMB. Also, it wasn't just ONE game that caused this, either. Although one title does come to mind and it wasn't even what you or I would call a "Big" game. I'll give you a hint: HPatOofP. " Rather than jump to conclusions, we decided to contact the two parties involved for comment on the situation. First to respond was Jeff Brown, EA's vice president of corporate communication. "Not no-how, not no-way did that ever happen. This is a total fabrication – total nonsense. We think voice chat is an extremely cool feature and added it to Madden/ PS3." Brown then added, "We support cross-game voice on other systems and would be happy to do that on any console." Soon after Brown responded to our inquiry, Sony's senior director of corporate communications Patrick Seybold also responded, keeping things short and sweet. "This is rumor and frankly not true. " I suppose it's up to the reader to determine what they believe, but I'm leaning towards the rumor being utter nonsense. Two responses from EA and Sony both were far from the 'no comments' and 'not responding to rumors and speculation' I've come to expect in situations like these. Ht up the link to read through the full forum post, and thanks to everyone who sent in the tip.